Bill Dillon of Plum Creek Kennels uses Fresh Cab in his kennel and RV 12 months a year to keep rodents out, without fail. Bill’s tip: place pouch in hanging suet cage off the floor to allow for easy spray-downs without having to move pouches daily. Controlling rodents in dog kennels, dog training facilities, and hunting lodges is a big problem. Using an integrated pest management (IPM) plan and prevention based approach makes pest control easier. Rats and mice have always been experts at getting what they want. Even modern pest management professionals need to use every trick in the book to outwit them! Controlling rodents in kennels, boarding facilities, hunting lodges, and pet food storage areas is a unique challenge. Dog food is the #1 attractant for hungry rodents. Dog stools are also attractive to rodents due to the high nutritional content. Finally, traditional rodent traps & poisons use baits to attract rodents. These three things attract mice and rats, intensifying the problem. 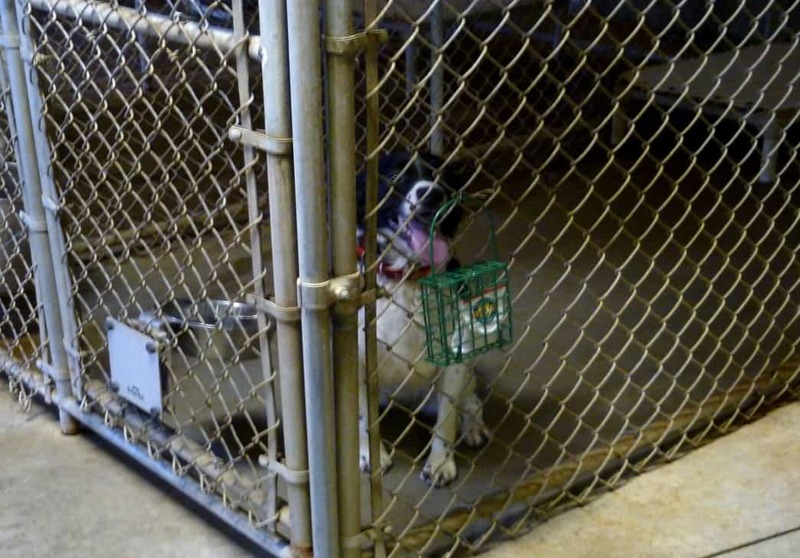 For the kennel owner, several musts include: Raising a healthy dog, keeping a clean kennel, commitment to a safe environment for workers and pets, and having a great reputation that speaks for itself. Fresh Cab can help on all counts. 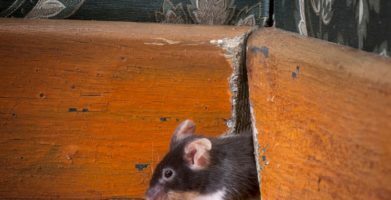 Damage from rats and mice adds up to over $1 billion in losses annually. The demand for methods to control rodents effectively in “green” ways can challenge or frustrate dog kennel owners. Rodents are nearly unstoppable. Mice can survive and reproduce in temperatures as low as 24 degrees if they have adequate food and nesting space. In one year, one mouse produces up to 18,000 droppings, and a mouse couple can create as many as 15,000 offspring. Rats have been known to eat up to 2.7 ounces of dog food in a day—that’s 61 pounds of food per rat each year! Add to this, an accidental poisoning of a champion dog you have raised or trained. To control rodents in an eco-friendly way, dog kennel owners need a reliable rodent control product. Fresh Cab is the first and only EPA-registered, indoor-use, botanical rodent repellent. Knowing the five structural areas most vulnerable to rodents, and understanding how to use Fresh Cab, can help dog kennel owners win the rodent battle in even the hardest-to-control situations. 1. Drop ceilings. Mice and rats love dark areas where they can live undetected. Ceiling crawl spaces and drop ceilings are hard for humans to get to, which makes it hard to monitor and control rodents. Fresh Cab rodent control effectively keeps rodents out of these areas for a month or more—or can be used to chase mice and rats into another area where they can be successfully trapped or baited. 2. Meters and electrical panels. In almost any business, rodents seek out meters and panels as points of entry, nesting sites, and places to cool down or warm up. They also love to gnaw on wiring. Check around water meters, electrical panels, junction boxes, and wiring harnesses. Pay particular attention to hollow blocks or transformers near an electrical panel—they may serve as a nesting site. 3. Utility lines. Rodents have sharp claws, are great climbers, and love to climb and run along electric wires, pipes, poles, ropes, cables, conduit, augers, conveyors, and even underground utility and communication lines. A kennel owner controlling the rodents who can “read the building lines” has a powerful tool, and Fresh Cab is highly effective when placed where it will disrupt a scent trail. 4. Pallet racks. Pallet racks and partially capped upright beams in warehouses and distribution centers can be a superhighway for rodents, allowing them to come and go almost undetected. Many facilities have seen excellent results from integrating pest management methods with perimeter trapping, bait stations, and Fresh Cab pouches placed on or near pallets every 8 feet. 5. Holes. Pest management professionals doing an inspection should always assume that the structure has changed or deteriorated since the last inspection. Construction defects, gaps in fascia board, and poorly caulked entrance areas around wires and vents lead to rodent infestations. (By the way, caulk and expandable foam are fillers but are not sealers and will not stop rodents from entering.) “Stopping rodents at the hole” can keep a business rodent-free and is the ultimate “green” solution. Botanical rodent repellent prevents pests while protecting pets. Stored items are a haven for rodent infestations. When an area offers shelter from the elements and limited human disturbances, as most storage places do, they are extremely appealing to rodents. If that storage area stores food stuffs for a food distributor, it will be exponentially more attractive to rodents. Clean up. 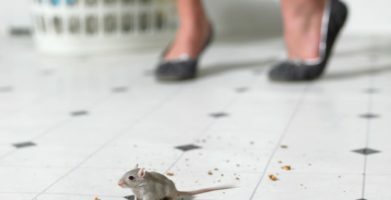 Clean up crumbs, spills, or anything else that may offer rodents a potential food source. Remove any standing water or moisture sources. Limit nesting materials, cover, and hiding spots by keeping things tidy and organized. Seal up. Close any potential entry points. Pay special attention to cracks in a building’s foundation; dryer vents; plumbing or electrical outlets; doors; windows; chimneys and roof soffits. Pouch up. Place Fresh Cab® rodent repellent pouches anywhere you have seen or suspect rodent activity. For preventative use in non-infested areas, simply place one pouch for every 125 square feet, scent lasts up to 90 days. For use in currently infested areas, increase use to one pouch per 8 square feet of floor space and replace every 30 days. That can be a tricky situation! Start by keeping the dog food cleaned up and stored in airtight, chew proof containers. Fresh Cab Rodent Repellent is safe to use around dogs and will repel rats. Depending on how much air flows through your dog buildings, the scent may wear off more quickly than the usual 30+ days. Please don’t hesitate to call or email with any additional questions you may have. Thanks for reading! I have a very bad mouse infestation in my house. I also have several inside Pets. Traps do not seem to be very affective, there’s just to many mice. I’m afraid to use poison because of my Pets. Any good advice you can give would be greatly appreciated! That sounds very stressful! Start by making sure all of the dog food is stored in tightly sealed containers; dog food is a mouse’s favorite snack. Also, make sure any dog waste is promptly cleaned up and disposed of, as rodents may also eat dog feces. If you have an idea where the rodents are coming from, block the entry points with steel wool and silicone caulk. Finally, use a botanical rodent repellent like Stay Away Mice to deter mice. If you need more help, please don’t hesitate to call (800)583-2921 M-F 8-4:30 EST or email customercare@earthkind.com Thanks for commenting! I have a 4000 square foot dog kennel in which I have free standing 10×10 foot pens. I have developed a problem with rats even though all food items are in metal containers. There is a drop insulated ceiling and I am sure this is part of the problem. Would your product humanely and safely eliminate the population so I can get them and their fleas out?! Yes. Please contact us by phone (800)583-2921 M-F 8-4:30 EST or email customercare@earthkind.com if you need more information. Thanks for reading! Bill Dillon of Plum Creek Kennels uses Fresh Cab in his kennel and RV 12 months a year to keep rodents out, without fail. Bill's tip: place pouch in hanging suet cage off the floor to allow for easy spray-downs without having to move pouches daily. Controlling rodents in dog kennels, dog training facilities, and hunting lodges is a big problem. Using an integrated pest management (IPM) plan and prevention based approach makes pest control easier. Controlling rodents in kennels, boarding facilities, hunting lodges, and pet food storage areas is a unique challenge. Dog food is the #1 attractant for hungry rodents. Dog stools are also attractive to rodents due to the high nutritional content. Finally, traditional rodent traps & poisons use baits to attract rodents. These three things attract mice and rats, intensifying the problem. For the kennel owner, several musts include: Raising a healthy dog, keeping a clean kennel, commitment to a safe environment for workers and pets, and having a great reputation that speaks for itself. Fresh Cab can help on all counts. Damage from rats and mice adds up to over $1 billion in losses annually. The demand for methods to control rodents effectively in “green” ways can challenge or frustrate dog kennel owners. Rodents are nearly unstoppable. Mice can survive and reproduce in temperatures as low as 24 degrees if they have adequate food and nesting space. In one year, one mouse produces up to 18,000 droppings, and a mouse couple can create as many as 15,000 offspring. Rats have been known to eat up to 2.7 ounces of dog food in a day—that’s 61 pounds of food per rat each year! Add to this, an accidental poisoning of a champion dog you have raised or trained. Clean up. Clean up crumbs, spills, or anything else that may offer rodents a potential food source. Remove any standing water or moisture sources. Limit nesting materials, cover, and hiding spots by keeping things tidy and organized. Seal up. Close any potential entry points. Pay special attention to cracks in a building's foundation; dryer vents; plumbing or electrical outlets; doors; windows; chimneys and roof soffits. Pouch up. Place Fresh Cab® rodent repellent pouches anywhere you have seen or suspect rodent activity. For preventative use in non-infested areas, simply place one pouch for every 125 square feet, scent lasts up to 90 days. For use in currently infested areas, increase use to one pouch per 8 square feet of floor space and replace every 30 days. string(100) "5 expert tips to safely & effectively control rodents in dog kennels, and pet food storage areas"